ARABIAN GULF (NNS) -- The George H.W. 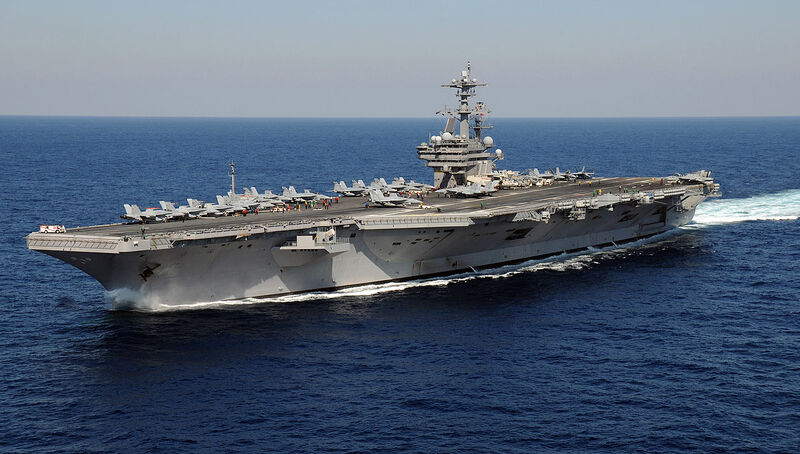 Bush Carrier Strike Group (CSG) is currently launching missions against the Islamic State of Iraq and Syria (ISIS) in support of Operation Inherent Resolve (OIR) from the Arabian Gulf. Rear Adm. Kenneth R. Whitesell, commander, CSG 2, said the missions are part of the key to accelerating the fight against ISIS. Whitesell credited the strike group's readiness on the extensive training leading up to deployment. "This is what we've been training for," said Whitesell. "We're ready to support the mission wherever and whenever we're needed. We have a crew of highly-trained, warfighting professionals ready for this mission, and I know that we, along with our allies and regional partners, will be successful." OIR is the unwavering resolve and commitment of the U.S and partner nations in the region and around the globe to eliminate the terrorist group ISIS and the threat they pose. The George H.W. Bush Carrier Strike Group is comprised of the staff of CSG 2; USS George H.W. Bush (CVN 77); the nine squadrons and staff of Carrier Air Wing (CVW) 8; Destroyer Squadron (DESRON) 22 staff; guided-missile destroyers USS Laboon (DDG 58) and USS Truxtun (DDG 103); and Mayport-based guided-missile cruisers USS Philippine Sea (CG 58) and USS Hue City (CG 66). In the above and below U.S. Navy photos by Mass Communication Specialist 3rd Class Christopher Gaines F/A-18E Super Hornets attached to the "Golden Warriors" of Strike Fighter Squadron (VFA) 87 launche from the flight deck of the aircraft carrier USS George H.W. Bush. Great news! Another argument in opposition to the dimwits who have argued against any expansion of naval forces, especially including carriers and supporting battle group vessels. You posting almost makes me wish I were once again haze gray and underway! Well, almost. We had our time and we did our duty in the Navy. These young people have the watch" now. Yes, it would be beyond humorous if I were on active duty at sea again!